Staff at the Bolshoi Theater have written an open letter voicing their doubts about the findings of the official investigation into the acid attack on Bolshoi Ballet Artistic Director Sergei Filin case. The staff and management of the Bolshoi Theater staff have expressed their doubts about the recent arrest of dancer Pavel Dmitrichenko as the organizer of the acid attack on Bolshoi Ballet Artistic Director Sergei Filin. Several hundred Bolshoi employees signed a letter addressed to police and Russian government officials in they assert that Dmitrichenko, is a good person and incapable of such an act. “We have known Pavel for many years, and although he is known for his fiery temperament, harshness and straightforwardness, he is a decent, thoughtful man who is always ready to stand by you,” read the letter. More than 300 staff members signed the letter, including prima ballerinas, honored artists of Russia, principal dancers and opera soloists. Police responded immediately. First, Lieutenant-colonel Maksim Vanichkin, deputy chief of the Moscow city police criminal investigations department, said that police were ready to cooperate with everyone who is willing to help. “If these citizens report some objective facts proving that the arrested persons are not involved in the crime, police will check their information. So far, there has been no such information,” Vanichkin said. He later made another statement: “The suspects have been detained and offered confessions. The investigation is on going. There is no evidence to suggest that the suspects were not involved, say, an alibi, or another suspect,” Vanichkin said. According to the police, the investigation is over and the entire chain of suspects has been identified: the person who ordered the hit, dancer Pavel Dmitrichenko; the person who carried it out, Yury Zarutsky; and the accomplice who drove Zarutsky to the scene, Andrei Lipatov. Zarutsky, for his part, took sole responsibility for the crime. He said he had been talking to Dmitrichenko about Filin, and that, according to Dmitrichenko, “Filin was spending budget money as he wanted and wasn’t paying them. Dmitrichenko shared with me that he wanted Filin beaten. But he never offered me money for this. Then I got the idea to damage Filin’s face, but Dmitrichenko knew nothing about it – it was my idea, and my idea alone,” Zarutsky said suring the investigation. Anatoly Iksanov, the theatre’s general director, said in a lengthy interview with Rossiyskaya Gazeta that he doubted the thoroughness of the investigation and that the real mastermind behind the attack had not yet been identified. “Dmitrichenko says that he only ordered a beating. The staff have questions about his implication and the degree of punishment that he will receive. 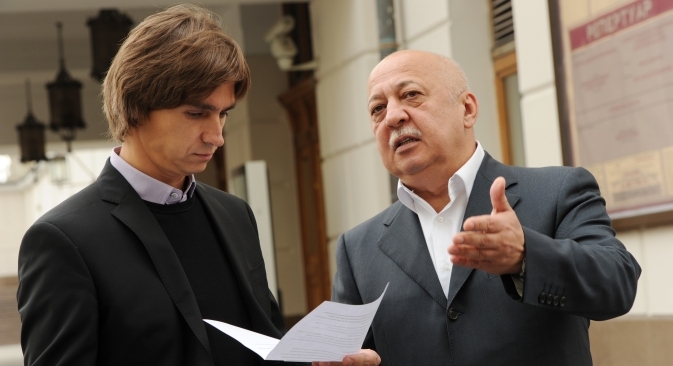 But there are some other forces – the ‘puppet masters’ – who are interested in creating the negative image of Sergei Filin and turning Pavel Dmitrichenko into a champion of justice. Of course, he is not the one who ordered the attack. Moreover, the investigation has not looked into other circumstances. Filin’s mail accounts were hacked, a fake website was created and his cell phones were disabled on Dec. 31 Jan. 1. These events are connected, all part of one diabolical plot. If they take the investigation to its natural conclusion, then all of the perpetrators will be discovered,” Iksanov said. Filin remains in Germany undergoing treatment for the attack, which took place on Jan. 17. The sulphuric acid that was thrown in Filin’s face caused third-degree burns of his face and eyes. Filin has undergone more tha 10 surgical procedures in an attempt to save his sight.